The more we rely on email, the more susceptible we are to spam and phishing attempts by cyber frauders. Recently, yet another company lost 3.8 million when they made a bank transfer requested by a spoofed email. How did it happen? The attackers set up an email account that mirrored [Alutiiq CEO] Hambright’s email address and sent an email to Alutiiq’s controller that gave instructions about a “confidential transaction” by a person who called minutes later. Pretending to be an attorney, the co-conspirator requested an “urgent” transfer of the $3.8 million “to an entity later revealed to be a fictitious third party company based in Hong Kong,” Hambright wrote. Hambright and the chief financial officer discovered the transfer two days later. All companies small and large are susceptible to scams like this. 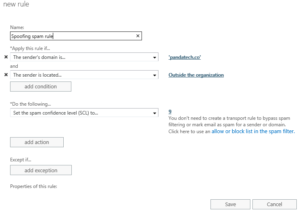 Fortunately for Office 365 users, there is an easy way to effectively block spam and spoofing attempts by blocking senders from “Outside the organization”. 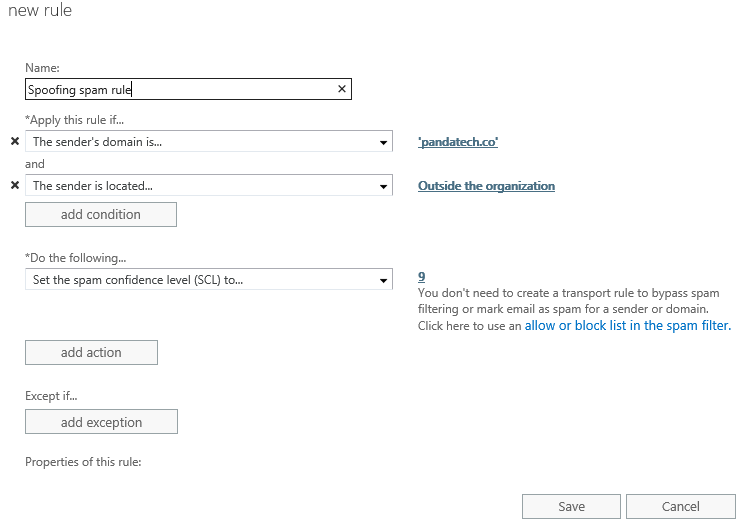 Microsoft TechNet Blogger Caltaru Mihai also mentions this technique near the end of his Block Spoofing in Office 365 post and appropriately cautions “that this is a dangerous rule if not configured correctly, but it is very effective at blocking spoofing“. 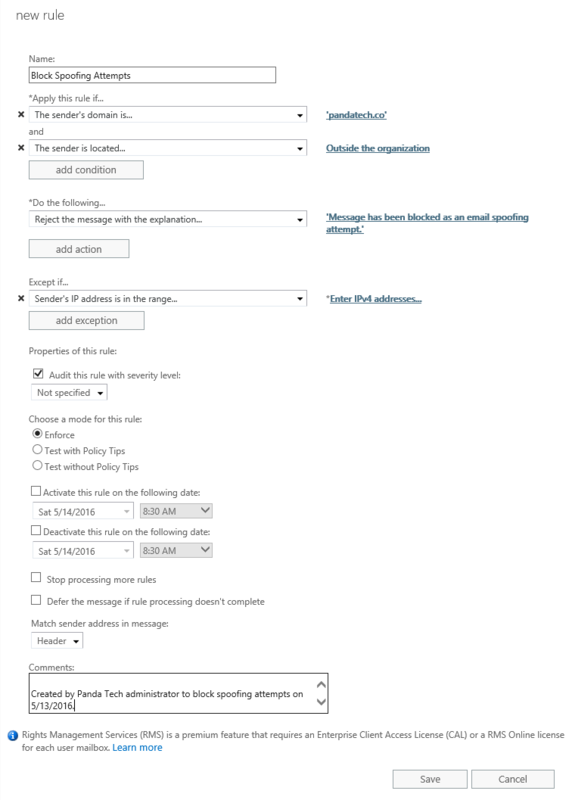 Reject the message with the explanation… Message has been blocked as an email spoofing attempt. Let me know if this rule works out for your organization, or if you find some new ways to improve it! 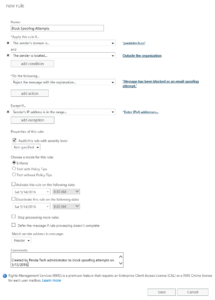 This entry was posted in Office 365 and tagged Office 365, phishing, spam, spoofing. Bookmark the permalink.